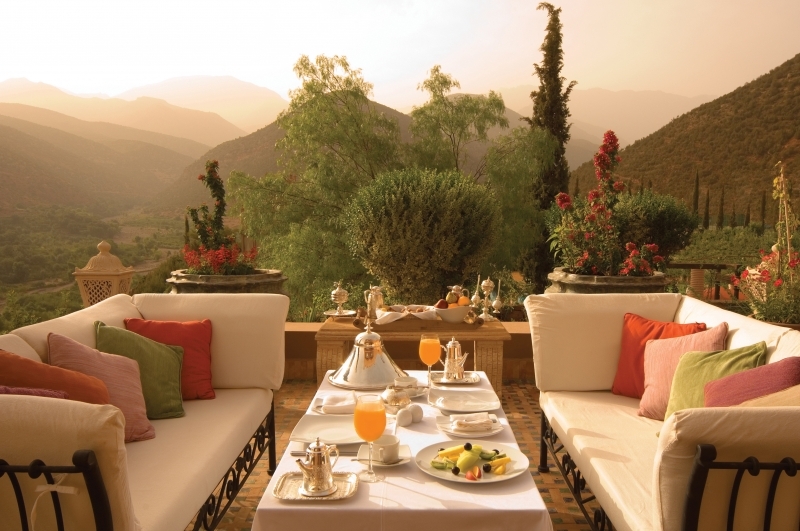 A little less than an hour away from Marrakech, Morocco, you'll find Kasbah Tamadot, a secret hideaway in the foothills of the Atlas Mountains. 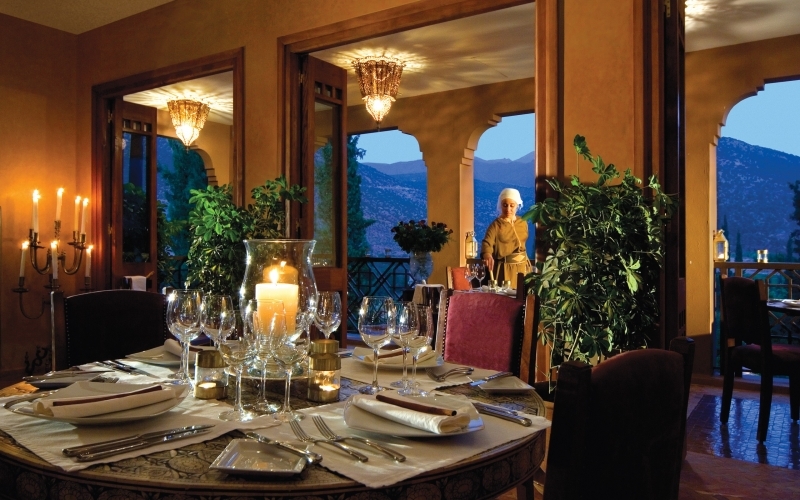 Owned by Sir Richard Branson, Kasbah Tamadot is an award-winning luxury hotel perfect for visitors who want to unwind and enjoy the mountain air. 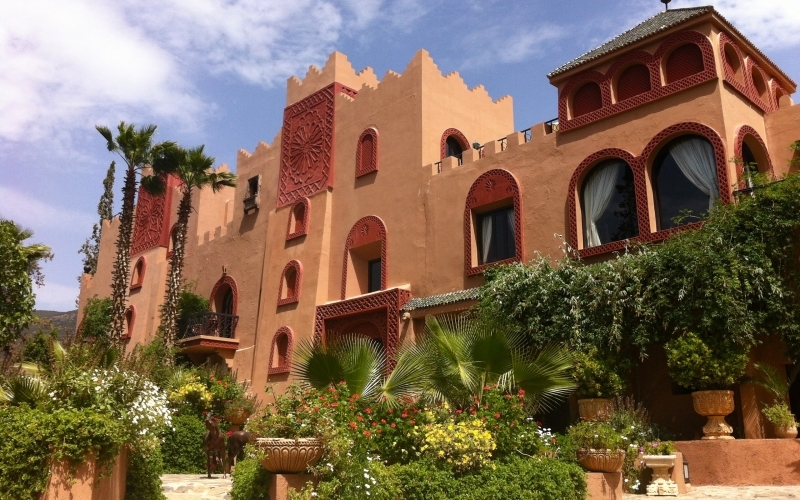 The walled-in grounds are a relaxing retreat away from the city of Marrakech, surrounded by centuries of history. According to Greek mythology, the Atlas Mountains were home to Atlas, the leader of the Titans and the god who carried the sky on his back. Kasbah Tamadot captures the mythical spirit of its surroundings, and makes each guest feel like a modern day god or goddess. 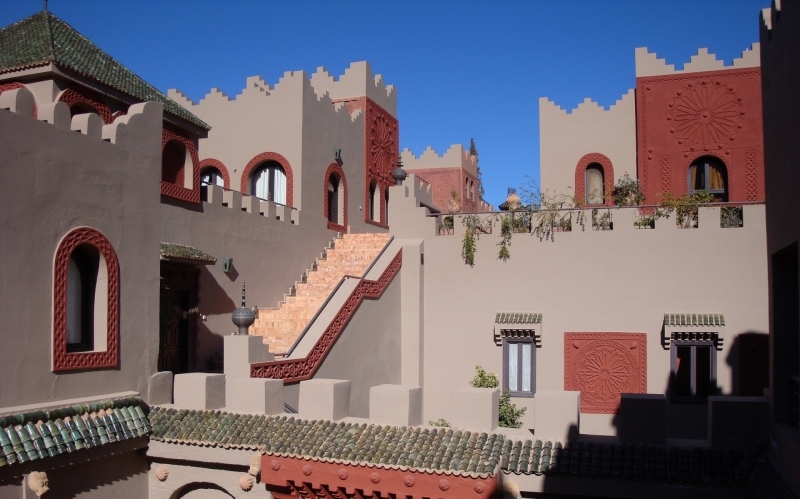 Peter Gabriel, Annie Lennox and Mick Jagger have all been to the luxurious riad, located 4,300 ft above sea level. The highest peak of the Atlas Mountains, Mount Toubkal, is an amazing experience in itself and each of the luxurious Berber tents in the Tamadot offers a first class view to the peak. There are lots of gardens, courtyards and staircases around the place with the infinity pool offering partakers of its grandeur arguably the most stunning view of the famous mountains. An indoor pool is always at hand if the outdoor air is a little nippy. Sir Richard Branson is the famous founder of the Virgin Group with a net worth of about $4.8 billion. His investment in real estate spreads across the seas from the British Virgin Islands to the South African Ulusaba Private Game Reserve. 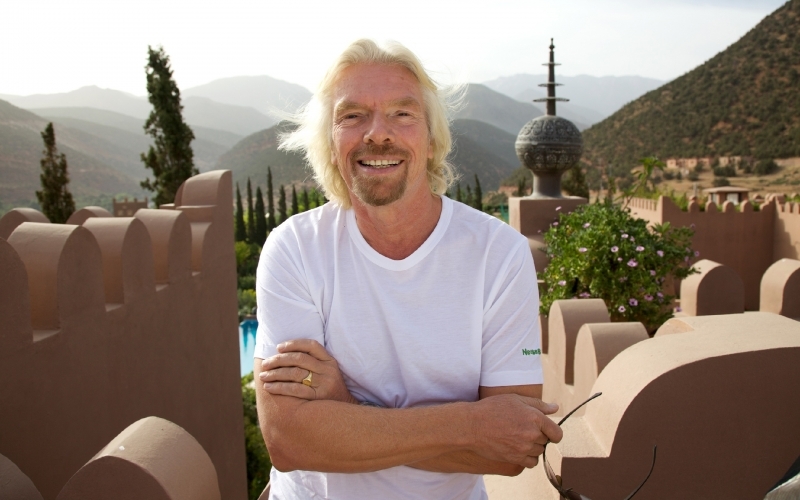 Branson discovered Kasbah Tamadot on a trip to Morocco, and he purchased it in 1998 from Luciano Tempo, an Italian antiques dealer and interior designer. 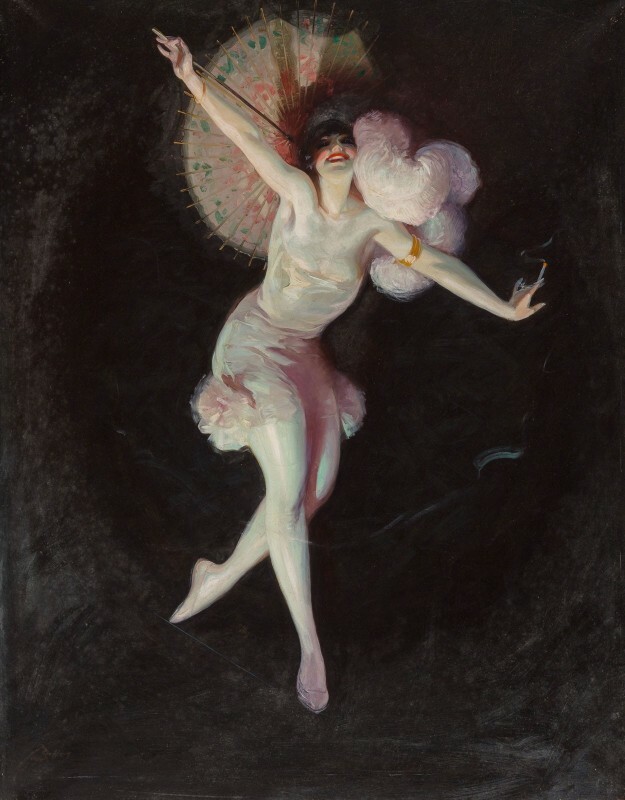 At the time, Branson also inherited Tempo's warehouse, which housed traditional North African and Indian sculptures and ornaments. He used these treasures to furnish and decorate Kasbah Tamadot, thus creating one of the most iconic travel destinations. Kasbah Tamadot is home to 27 luxury rooms and suites, all individually decorated using traditional Moroccan furnishings and designs. Due to their distinctive styles, each room has been given a different Berber name to describe its unique personality. The master suite is a miniature Kasbah ideal for large groups and parties. It is home to several luxury suites, a private pool, and a rooftop terrace. It is a true hideaway that offers guests complete privacy and total escape from the bustle of city life. 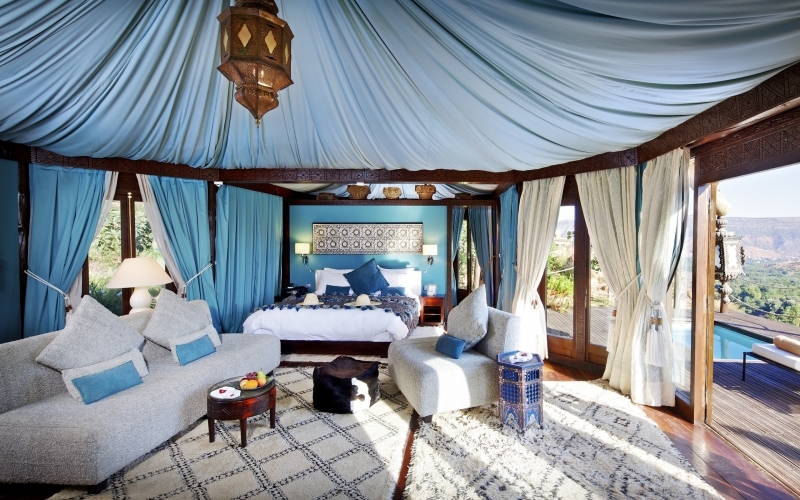 Kasbah Tamadot also offers guests the option of staying in a luxury Berber tent. Ideal for a romantic getaway, tents include private decks, hot tubs, and full amenities nestled among a serene and hidden landscape. Kanoun restaurant serves local and international cuisine using traditional Moroccan flavors and spices. A notable selection of local and international wines accompanies and enhances the flavors of each sophisticated dish, and guests can choose to dine on Kanoun's beautiful rooftop terrace or poolside veranda.